Archaeologists excavating the site of a Roman villa say artefacts have been stolen and damage caused by thieves using metal detectors. The team arrived at the site just north of Lincoln on Thursday morning to find 31 holes had been dug there overnight. 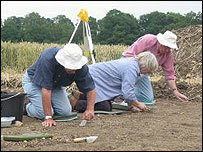 The four-week dig is a joint venture between Lindum Heritage and Bishop Grosseteste University College Lincoln. Zoe Tomlinson, from Lindum Heritage, said the damage caused would have a lasting impact. She said: "We're absolutely furious. Whatever they've taken is theft because any finds on the site belong to the landowner Owen Day Farms. "They could have taken anything. The most likely things they've taken are rusty Roman nails which have no monetary value, but have archaeological value. "They've destroyed part of the integrity of the site. It's immoral. It's criminal vandalism. What they've destroyed can never be replaced." The archaeologists have now taken all the metal from the site.